The Situation: Super Smash Bros (classic) with 3 other friends of highly varying skill levels in the living room. The Play: I jump between two battling opponents and knock both of them away simultaneously. The Question: See post title. Great, now I feel like those professional athletes that say dumb things in interviews. So why doesn’t everyone who jumps and presses A get double kills? The infrequency of aerial neutral A double kills can be attributed to two concepts: positioning and timing. Let’s quickly define the terms, so that we can all be on the same page. Pro-tip: Don’t position yourself inside the lightning. Positioning is the idea of where your character is in relation to the other interesting things in the match. This is important because attacks don’t hit everyone every where on the map and it’s up to the players to try to get opponent characters inside the area of effect for their attacks more often than their character is inside the area of effect of opponent attacks. Of course, characters don’t stay in the same place the whole time. Even if they are standing in one spot, that doesn’t necessarily mean they’ll still be there by the time I get over there to attack them. Even worse, some attacks require that my character wind up to attack. 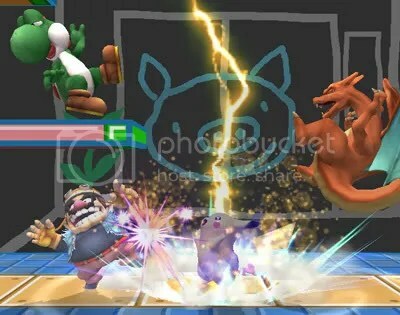 This means that even if I’m in the right position to hit my opponent at the time that I start my attack, there’s a chance that they will react and move away before the attack connects! On top of that, when a character gets hit they usually get knocked back or staggered so that they can’t make their own attacks. This makes it a powerful tactic to use quick jabs to interrupt an opponent winding up for a powerful attack before they can land it. Timing gets even more complicated when more characters are added into the equation. With each character added, I have to keep track of more attacks to avoid and vulnerabilities to capitalize on. Congratulations: You described the mundane in technical language. The point of the above (incomplete!) discussion on the mechanics of Super Smash Bros is to demonstrate just how much goes into just playing the game. Obviously, I didn’t explain that aerial neutral A double kill play very well at the time I was asked, but it wasn’t because I’m stupid. All of those understandings of positioning and timing (among other things) were already packed into the intuition that I had built up by playing the game and by the time I actually had to use words to explain what I was doing, I had taken it all for granted. Humans have a big problem with taking skills they’ve already mastered for granted, and gamers are no different. Yet, when we look down on other people for not understanding the obvious (ie that which we’ve already built an intuition for), we end up excluding people. In my opinion, this is the exact antithesis of the interactivity that games have to offer, both between player and player as well as between developer and player. So what about you? What do you think games, or even gamers take for granted as “obvious”?